I have consolidated the Sharepoint 2010 new feature in this article. It will be useful to sharepoint 2007 developers who want to migrate to Sharepoint 2010. In SharePoint 2010 you can find many user interface change like, “Site Actions” menu is moved to left side of the page, some new options has been added in the “Site Actions” menu etc. Ribbon UI interface has been introduced in Sharepoint 2010 as like MS Office 2007 which brings the SharePoint user experience much more aligned with other office applications. You can see the Ribbon in the top area of any page in the SharePoint 2010 website, see the below screenshot. SharePoint 2010 you can use SilverLight components without any additional configuration. First you will need to upload your SilverLight XAP file into a document library, then add SharePoint’s OOTB SilverLight web part on a page and point it to the respective XAP file uploaded in the document library, SilverLight XAP component will be successfully added and displayed in the page. SharePoint 2010 provides built-in office-style themes just like in Word and PowerPoint. You can choose and apply a theme to change the look and feel of the web site as per the selected theme. You can also preview a theme on the web site before applying it. You can create the PowerPoint themes and imports themes from Microsoft PowerPoint. SharePoint 2010 supports Internet Explorer 7 and above, Firefox, and Safari. Bad news to Internet Explorer 6.0 users, It is not supporting IE 6 anymore. Also there is no official news about its support for Chrome and Opera. SharePoint 2010 offers Rich Media capabilities out-of-the-box and makes it very easy for users to share videos, audio, pictures, and other rich media files. A new asset library has been introduced in SharePoint Server 2010 which is specially designed to manage and share digital assets like video, audio, pictures, and other rich media files. Couple of web parts and controls has been also added to streamline the Digital Asset Management capabilities. SharePoint 2010 includes a Media web part built using Silverlight, Video content type, Audio content type, and Image content type. Microsoft Office Groove has been renamed to SharePoint Workspace in SharePoint 2010. SharePoint Workspace provides local and offline read-write access to SharePoint lists and libraries and also incorporates offline-online synchronizations. SharePoint Workspace is not only got new name but also a lot of new functions and better design. If you remember, in SharePoint 2007 all the solutions (.WSP) run with full trust which requires farm administrators to pitch in and deploy the solutions. Also the solutions can be deployed at the minimum at a web application level. It means if a solution is deployed in a web application, it will be applicable for all the site collections available in that web application. In SharePoint 2010, Sandboxed Solutions also called as User Solutions, is a new concept which addresses the above issue by allowing site collection administrators to deploy solutions at the site collection level which is safe to run and not affect the other site collections and web applications running on the same farm. Farm administrators can monitor sandboxed solutions and place restrictions on the resources, such as memory and CPU cycles, they can use. Sandboxed Solutions does not cover full SharePoint object model but it addresses the key scenarios like custom web parts and event receivers. The solution deployment as in SharePoint 2007 is still exists in SharePoint 2010 but those solutions are called as Farm solutions. In SharePoint 2010, the Stsadm command-line tool has been deprecated and it will be superseded by Windows PowerShell 2.0. SharePoint 2010 will still support the Stsadm command-line tool for backward compatibility with previous product versions. But it is recommended to use Windows PowerShell 2.0 when performing command-line administrative tasks. It will be the interesting news for powershell fans like me. You can find the redesigned Central Administration in SharePoint Server 2010 which to provide a better user experience and make it easier for administrators to find what they are looking for. All commonly used tasks are grouped as shown below. In SharePoint 2010, Shared Service Providers (SSP’s) are no more available. SSP’s have been replaced by Service Applications in SharePoint 2010. Earlier in SharePoint 2007, all services were combined into a SSP. Now is SharePoint 2010, all services are running as independent Service Application. You can select and configure from available services to run on an application server. You can also select and configure only required services for a particular web application. SharePoint 2010 will require an x64 edition of either Windows Server 2008 or Server 2008 R2. It also requires a 64-bit version of Microsoft SQL Server 2008 or SQL Server 2005. You have to install 8GB ram in order to use the SharePoint server without any slog. 64 bit CPU and 8GB ram will be one of the disappointments to individual developer who want to install SharePoint in Desktop/Laptop system. It required system up gradation. Business Connectivity Services (BCS) provides read/write access to external data from line-of-business (LOB) systems, web services, databases, and other external systems within Microsoft SharePoint 2010. Business Data Catalog (BDC) 2010 has been replaced by Business Connectivity Services in Sharepoint 2010. Using BCS, you can read and write back to external systems from SharePoint 2010 site. Using BDC in SharePoint 2007 site, you were able to read data from external system but it didn’t support to write back to external system. BCS supports cache-based and offline work features. Now users can manipulate external data when they are working offline and all the read/write operations performed against cached external data are synchronized when connection to the server becomes available. BCS supports reading binary large object (BLOB) data from the external system. Enhanced object model and APIs which enables developers to write generic applications to work against any external system. BCS provides batch and bulk operation support. So now it is possible to read multiple items in a single call which reduces the round trips to the external systems significantly. External data can be converted to a list like view very easily using External Lists. SharePoint 2010 is equipped with Visio Services which allow you to share data linked diagrams in real time. Using Visio Services you can connect to backend, visualize the data and publish the Visio diagram into your SharePoint site. Visio data diagrams can be rendered without the need for Visio on the client computer. Improved User Interface together with Ribbon which improves its usability and make it consistent with the UI of SharePoint 2010 and other office applications. SharePoint 2010 is equipped with SharePoint Best Practices Analyzer which provides Microsoft’s guidance for SharePoint implementation and troubleshooting and creates detailed reports to help administrators achieve greater performance, scalability, and uptime. A Problems and Solutions page in the analyzer helps you solve common implementation problems. SharePoint 2010 includes a new database designed to support usage reporting and logging. The name of the database it creates is “WSS_Logging”. 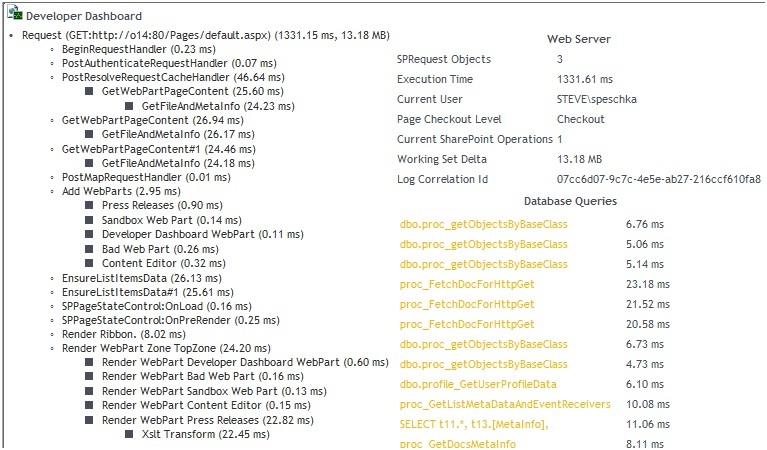 SharePoint 2010 keeps tracks of everything it does by logging into the WSS_Logging Database. If you remember in SharePoint 2007, Microsoft has recommended to not access any SharePoint database directly. But in SharePoint 2010, the logging database is the only database that Microsoft will be happy to let the developers directly read, query and build custom reports against it. Developer dashboard is a new feature introduced in SharePoint 2010 which displays the performance and tracing information in the bottom of every page likw how long did the request take to run?, what event handlers were fired?, In what sequence did these event handlers fire?, etc. Developers can use this information to debug and troubleshoot issues with page rendering time. By default this feature is disabled, but we can enable this feature in the development environments to get this additional information. Microsoft has introduced a new set of tools within the Visual Studio 2010 which make developing SharePoint applications as easy as any other .net applications. The new tools include project templates for many of the SharePoint application types, such as Web Parts, List definitions, Modules, Application Pages, Workflows, user Controls and others. A great feature in Visual Studio 2010 is the Visual Web part Designer. Now you don’t need to build tables for layout, you can just drag and drop and create controls within web parts, similar to ASP.Net forms and user controls. Now in SharePoint 2010, you can use Language Integrated Query (LINQ) objects to query SharePoint lists. Earlier in SharePoint 2007 (MOSS 2007), using CAML queries was the only way to query SharePoint lists. SharePoint Server 2010 Search – the out-of-the-box SharePoint search for enterprise deployments included by default with SharePoint 2010. FAST Search Server 2010 for SharePoint – a brand new add-on product based on the FAST search technology that combines the best of FAST’s high-end search capabilities with the best of SharePoint. New Custom Ranking Models allow you to change the weights that are used by SharePoint Search to rank results. Custom Ranking Models are used in conjunction with the Core Results web part. 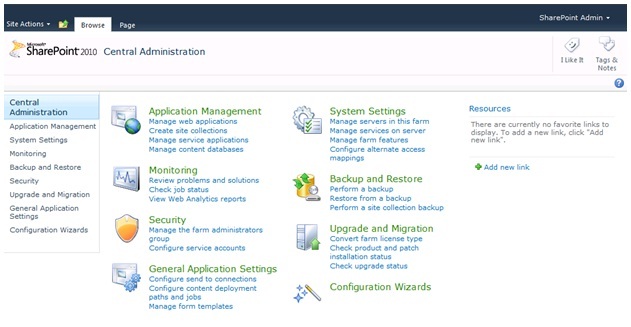 You can scale out the number of crawl/indexer components by adding additional servers to the farm and configuring them as crawlers which enables to increase crawl frequency, volume, and performance by distributing the crawl load among several servers, along with providing indexer redundancy if a server fails. SharePoint 2010 has capability to integrate FAST Search Server 2010 seamlessly. SharePoint 2010 supports wildcard search. Improved “did you mean” suggestions togethor with suggestions for related searches. Faceted search is another new feature in SharePoint Search 2010. When a search query returns a lot of results the faceted search functionality displays a refinement panel on the left side which can be used to refine the results based on criteria like Result type, Site, Author, Modified Date, Tags, etc. As you know the previous version of SharePoint (MOSS 2007) lacked on some of the main social features and developers needed to develop their own components to implement social features on top of SharePoint 2007. But now Microsoft has filled that gap in SharePoint 2010. Tags, Notes, and “I Like It” – Now in SharePoint 2010, a user can add tags and notes with any page which can be either public or private. A user can also mark a page if he/she liked that page. SharePoint 2010 adds two icons “I Like It” and “Tags & Notes” in all the pages to provide this functionality. Ratings – SharePoint 2010 allows users to rate items within SharePoint site, such as ratings various items within Document libraries, custom lists, blog posts, discussions threads, etc. Tag Cloud – SharePoint 2010 includes an out-of-the-box tag cloud which can be added to any page within the SharePoint site. 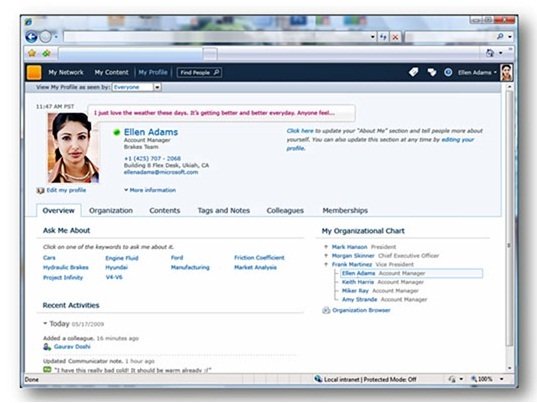 Newsfeed – Newsfeed is another features included in the SharePoint 2010. You can set the types of updates you want to get in your newsfeed. You can set this using the out-of-the-box settings section available within the user profile page. SharePoint Foundation 2010 incorporates a new authentication model that works with any corporate identity system, including Active Directory Domain Services, LDAP-based directories, application-specific databases, and user-centric identity models. SharePoint Health Analyzer is a feature included in the SharePoint 2010 that allows administrators to schedule regular, automatic checks for potential configuration, performance, and usage problems in the server farm. Any errors that SharePoint Health Analyzer finds are identified in status reports that are made available to farm administrators in Central Administration. Status reports that are produced by SharePoint Health Analyzer explain each issue, list the servers where the problem exists, and outline the steps that an administrator can take to treat the problem. In some cases, errors are repaired automatically as soon as they are found, and it also informs farm administrators about the repairs done. SharePoint 2010 has capabilities for Multi-Tenant Hosting which allows to setup hosting on site collection level. Now you can host customer1 (tenant 1) on a site collection and customer2 (tenant 2) on another site collection within same web application. Each tenant will only have administrator access to his/her site collection. Also, service applications will keep each tenants data separate from another tenants. For example, one shared search service application will service tenant1/site collection 1’s data and tenant2/site collection 2’s data while keeping them separate from each other. Microsoft Office Web Apps (OWA) is the online companion to Office Word, Excel, PowerPoint and OneNote applications that enables users regardless of their location to access documents and edit documents. Users can view, share, and work on documents with others online across personal computers, mobile phones, and the Web. Office Web Apps is tightly integrated with SharePoint 2010 Products. The Office Web Apps Feature and services integrate with SharePoint’s robust enterprise content management capabilities. Now all of those Office documents in your SharePoint environment can now be viewed and edited from almost any browser, anywhere. Office Web Apps also includes PowerPoint Broadcast Slide Show, allowing users to view PowerPoint presentations live, even when they’re a thousand miles away. For consumers and small-business users, Office Web Apps will be available on Windows Live as a free service. Business customers licensed for Microsoft Office 2010 through a Volume Licensing program can run Office Web Apps on a server running Microsoft SharePoint Foundation 2010 or Microsoft SharePoint Server 2010. Some of the Office Apps also support multi-user editing in different scenarios like excel in Office Web Apps but not in Client, OneNote in both Office Web Apps and Client, etc. All the updates done using Office Web Apps occur in near real time. You can access Web Analytics reports by going to Site Actions -> Site Settings. Under Site Actions heading you will see two links, Site Web Analytics Reports and Site Collection Web Analytics Reports. When you click on either link, you are taken to an overview page shows you key metrics for your site. You can then drill down to other reports by clicking on the left navigation, and can also change date range by clicking on Analyze tab on Ribbon. In SharePoint 2007, Content Types were the only way to to manage metadata. But it was really difficult to manage metadata with multiple site collections. Now Microsoft has introduced Managed Metadata Services in SharePoint 2010, which allows administrators to centrally manage metadata and share it anywhere in the SharePoint farm (across many site collections). SharePoint 2010 also has “folksonomy” tagging capabilities alongside traditional managed metadata lists. This means that users can add their own tags or keywords to documents. While this is configurable on an attribute-by-attribute basis, when enabled it looks to be a very useful way of refining the metadata model over time based on user input because administrators have the ability to add popular user-created tags into the formal managed taxonomy. UI Change: When you go to create a new list/library, a new form opens in the modal popup window which is a Silverlight component. All the actions/functionalities related to Lists/Libraries is moved to toolbar/ribbon. Lists/Libraries can have a custom validation for the field. This validation is based in a formula and will be fired when we try to save the item in the list. You can create a lookup for multiple columns. You can also do list throttling. You can store millions of items in a SharePoint list, but the query operation will become slower as the size of the list grows. Throttling allows realistic limit on the number of items that can be or should be queried from a SharePoint 2010 List. So list throttling help developers & administrators to control the large list & large list queries so that the performance of the whole SharePoint farm doesn’t decrease. SharePoint 2010 has introduced a new type of List called the External List. The External List is used for displaying content that comes from line of business applications and databases using the Business Connectivity Services (BCS) External Content Types. External Content Type can be created either using SharePoint Designer 2010 or Visual Studio 2010. Once the External Content Type is created, you can create the External List either from the Create page in SharePoint or via SharePoint Designer. External Lists provide you with full CRUD functionality meaning you can Create, Read, Update and Delete data all the way back to the data source (line of business applications or database). You can update the out of the box workflow in sharpoint 2010. Another interesting update in you can create the Visio workflow diagram and import into designer and deploy to your sharepoint 2010 site. I would like to cover workflow in details in another article. Hope you can enjoy this writing. Hi thanks for your post, I need your advice on creating a sharepoint intranet site. I want to create a site for my team at work, that will allow us share files, posts etc, however I want it to be able to allow members of the team create their personal profile pages from WITHIN this intranet site but I’ll need to grant them access to it with Active Directory. Am trying to get my head round the architecture, do you think this is possible and how?